Irish Christmas ornament features a pewter Claddagh. 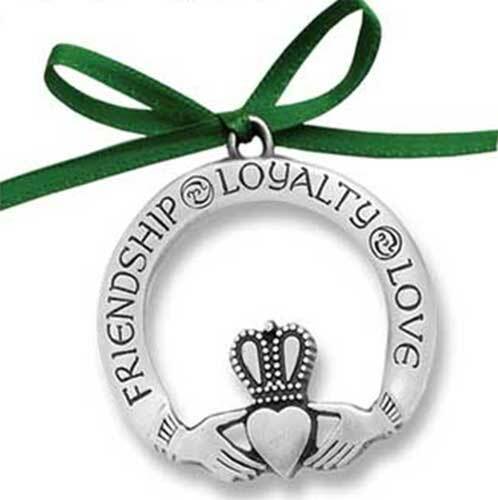 The words Friendship, Loyalty, Love are engraved on this pewter Claddagh ornament. This pewter Irish Christmas ornament features the iconic Claddagh symbol. The Claddagh Christmas ornament measures 2" diameter and includes a green ribbon for hanging on your tree. The Irish Christmas ornament is gift boxed with a Claddagh history card, complements of The Irish Gift House.